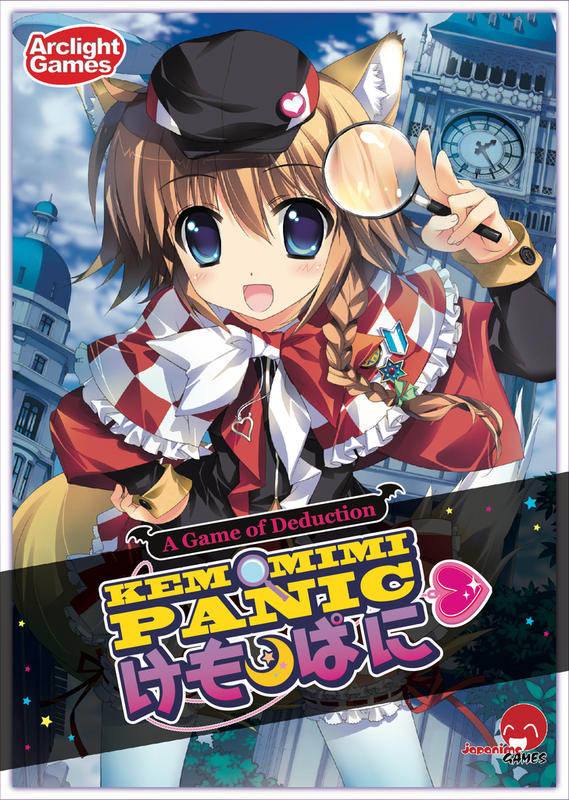 Kemomimi Panic is a game by Masayuki Kudo, published by Japanime Games. It is for 4-8 players. In this game, players take on the role of beast-eared citizens of the town of Mokemoke. They will be trying to keep their valuables safe from the infamous thief known as Crescent Moon. They will need to uncover the identity of the scoundrel before their treasures are taken, forcing them out of the town forever. In the end, if the citizens are able to master their powers of deduction and find the culprit before all of them are eliminated, they will all be declared the winners. If not, the criminal Crescent Moon will sneak back into the darkness to steal more treasures from unsuspecting citizens. To begin, it is recommended that for a group of player’s first game, a certain set of character cards and role cards should be used based on the number of players. For more information on this, please check the rulebook. For later games, the rulebook notes other character options that work well together that may be used. Once character cards and role cards have been chosen, a Facilitator is chosen. They will be overseeing everything to make sure the game runs smoothly. The Facilitator will then take the selected character cards and shuffle them together. Each player is then dealt one card each. Each player then looks at their card and then shows it to the rest of the players. The card is then placed face up in front of them. The Crescent Moon role card is removed from the deck and replaced with a Citizen card from the box. The deck is then shuffled. A random role card is then removed and placed back in the box. The Crescent Moon card is then placed back in the deck and the cards are shuffled again. The Facilitator will then deal a role card to each player including themself. Players take a look at their role card and place it face down in front of themself. Each player is then given a Decoy card by the Facilitator, which is placed face up on top of their role card. The Facilitator will then give the Moon card to the player to the left of the Detective Shamrock player. They place this card face up in front of themself with the Crescent Moon side up. The Target card is then placed in the middle of the play area. Play now begins. The game is played over several rounds which are divided into a Day and Night phase. Before this though there is a Game Starting phase. In this phase, the Detective Shamrock player chooses another player. Everyone but that player and the Detective Shamrock player will now put their head down and close their eyes. The chosen player must now honestly take one of two poses. If they are a citizen, they must make the OK sign with their fingers. If they are a thief or informant, they must cross their arms to make an X. Once this is done, the Detective Shamrock player will tell everyone to raise their heads and open their eyes. The player with the Moon card becomes the leader for the first day. This actually starts the game and begins the Day phase. In the Day phase, the players will talk amongst themselves, discussing who they think the Thief is. It’s suggested that this should take around 3 minutes and that the Facilitator should keep track of this. After the time ends, the leader will now choose a player, naming them as the Suspect. This is done by the leader saying, “You’re the suspect!” and then point the arrow on the Target card toward them. A vote is then held with players saying “Aye” if they believe the suspect is the Thief. If more than half the players vote Aye, then the suspect is confirmed. That player will now lose their Decoy card if they still have it. If not, they must turn over their role card. This eliminates them from the game. It should be noted that each character has a special ability and that the timing for this ability should be taken into consideration. If the eliminated player is the Thief, the game ends. If not then the game continues into the Night phase. Also if less than half of the players vote Aye, then nothing happens and the game continues into the Night phase as well. The Night phase is the second phase of the game. In this phase, the Thief will attempt a burglary of one of the other players. This only happens if the Moon card is on the Crescent Moon side. If it’s on the Full Moon side, then nothing happens. For the Thief to burgle, first the Target card is placed in the middle of the play area. All of the players will now place their right hands over the Target card in the middle of the play area without touching it. The Facilitator will then have everyone to shut their eyes, including themself. The Facilitator then goes through a small script, telling everyone that it’s night time and dark outside. That everyone is asleep and that the great thief is awake. The Thief is then told to open their eyes. They open their eyes and are told that they have 10 seconds to sneak into someone’s house. The Facilitator will then begin to count. The Thief player will move their hand just enough to turn the Target card toward the player that they wish to target. Once the Facilitator counts down to 0, they announce that morning has come and for all the players to open their eyes. All of the players will now open their eyes and move their hands from the center of the table. The player that has the arrow pointing toward them was burgled during the night. If they have a Decoy card in front of them, it is now lost. If not, they are eliminated from the game and must flip their role card over. If their was an effect that takes place at this time due to their role card, it activates. Once this is completed, the day is over. The leader will now flip the Moon card over to the other side and pass it to the player on their left. That player now becomes the new leader. A new day now starts with a new day phase. The game continues until one of two things happens. If the Thief player is eliminated, the game ends. If this happens all the Citizens are winners, including those that were eliminated. If there are only 2 players left, either because of voting or burglaries, the game ends. In this case, players must now check the role cards of the final 2 players. If they are a Thief and a Citizen, then the Thief wins. If the 2 roles are a Thief and an Informant, then the Informant wins. This game comes with a deck of cards packaged inside a tuck box which is packed into an insert with 2 spaces for tuck boxes. I have to say that I like the idea. It keeps everything from sliding around inside the larger box. It also makes room for an expansion that could be placed into the other tuck box slot, if one is made. The cards themself have a really nice finish and are easy to shuffle. The artwork is designed with an anime/manga style that I really like. Most of the cards have a very cute, sweet and innocent look to them. However there are a couple of cards that go WAY over the top and get a bit too revealing. For the most part the cards have these sweet little beast eared girls that look so sweet and cute. Some get a bit revealing and show a little whisp of underwear, which is completely fine. It’s those few cards that really reveal too much and move well past the minor fan service that is acceptable. For adults, the cards are completely fine. If you have kids, especially youger ones, those few cards are going to be a bit too much for them. Even for my older son, I feel that those cards are a bit too provocative. If you choose to play without those cards, the game is completely fine. I’d also say that if those types of things don’t bother you, then those few cards won’t either. In any event, it’s something that needs to be noted and that parents should be aware of before playing the game. Overall, I’m mostly fine with the cards. I do wish that the art style had stayed more in the line of cute and fun, instead of too revealing. The rulebook for this game, while small, it is fairly thick. Most of this is due to the very detailed section that explains each card in the box. This section alone consists of 10 pages. Mostly what this does is repeats the same information that is printed on each card. There are also 2 pages of character options, one of which is for first time players and the other is simply a bunch of different options based on player count. The rules themselves are fairly simple and are easy to read through. However each step and phase is explained in great detail so that the game is very easily understood. There aren’t really any examples of game play and the only pictures consist of the 10 pages of card explanations. Overall I think the book does a good job of explaining the rules and it looks pretty good too. I’m pretty pleased with the overall presentation. The first thing that most players will think of after reading through the rules for this one is how it compares to the game Werewolf. Yes, there are a lot of similarities between the 2 games. For one thing, both games are centered around the social deduction mechanics of gameplay. For those unfamiliar with the term, social deduction games are those where the goal is dependent on figuring out information that isn’t readily apparent and that involved discussion among players as one of the mechanics. Thank You Ted Alspach for explaining the definition so beautifully. The thing is that this game has a lot more about it then most games of the genre. For one, the original Werewolf is fairly simple and at times can be a bit boring and lackluster. This game provides a lot more depth than just simply voting someone out, as if they were a castaway on a liferaft. Each character has a special ability that provides a bit more life to the character. It’s these aspects of the characters that I really enjoy. There are even different types of Citizen cards, so that if a citizen is eliminated they may have a special ability that kicks in at that time. All of these different elements help to add a bit more to the game and provide a lot more life to it. I really like how it all melds together and makes for a pretty interesting and fun game. Of course, as I’ve mentioned earlier, the cards are a bit hard to overlook at times and this tends to affect the game a bit. Still, if you can get past the artwork the game itself is pretty solid. I also have to say that I like the idea of the decoy cards. I like how that you don’t automatically get kicked out if you lose a vote or are the target of the thief. It takes 2 times, giving you an opportunity to play a bit longer. Fans of social deduction games like Werewolf should really enjoy this one. I like it and would recommend it. However the recommendation comes with the caveat that you’re ok with the card art and don’t mind a few half naked women on your cards. For me, we might have to do some artistic improvements with a sharpie. Kemomimi Panic is a Japanese anime/manga style game of social deduction that involves lots of cute and sometimes underdressed beast eared girls. The game isn’t very long. Most game sessions last around 30-45 minutes, that is unless you let people talk and discuss the voting part of the game for too long. The cards have an anime/manga style artwork to them that I like. However some of the designs are a bit too provocative and show too much skin, especially for younger players. Parents should take note of this when deciding on if this game is acceptable at your table or not. For more mature players, this will most likely not be a problem. It’s just something to be aware of. The game itself improves on the social deduction mechanic and adds lots of cool powers that keep the game replayable. I like this a lot more than games like Werewolf. Fans of Werewolf will most likely enjoy this one a great deal. The game is pretty simple and easy to play. This is a game that I recommend, however only for those comfortable with the artwork. I can’t recommend this for younger players or families, not without removing or fixing a couple of cards. Overall the game mechanics are great but the game may not be suitable for everyone. Use your own judgement on this one. With the right group, it’s really good. I like it. 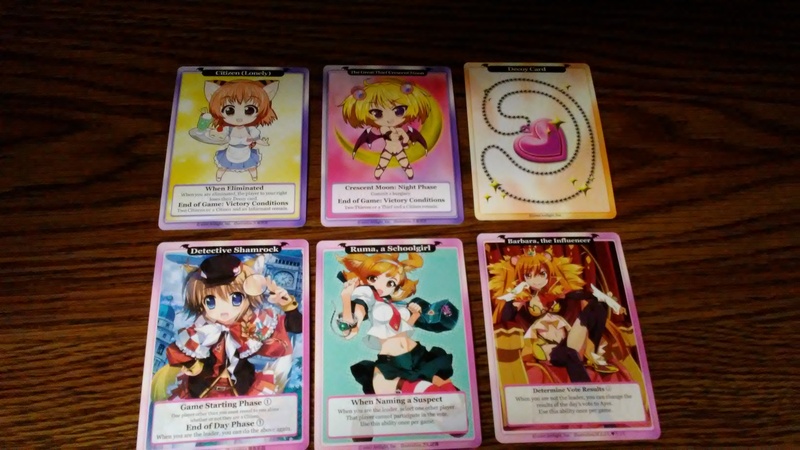 This entry was posted in Reviews and tagged board, board games, card, card games, games, japanime, japanime games, kemomimi, kemomimi panic, kudo, masayuki, Masayuki Kudo, panic. Bookmark the permalink.